I don’t want to compare anything else but the media playing capabilities of the devices. Since Sony is working together with many movie studios these days to make more and more movies available on it’s own proprietary format UMD. 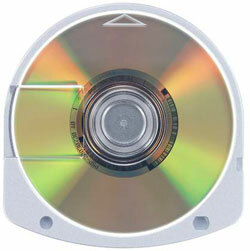 The Sony UMD is simply a standard DVD with 60 mm diameter and 1.8 GByte of storage space. The fact that the disc itself is in some kind of caseing and the fact that there are legal issues if you would try to burn your own UMDs makes it not the media of choice if you want to burn your own movies or recordings to watch them with the PSP. The second media type you could use with your PSP is the Sony MemoryStick. One disadvantage of the MemoryStick is that it’s quite expensive. Around 90 Euro for a 1 GByte MemoryStick DUO is quite a lot money. The PSP can play some MPEG4 formats and there are tools/encoders available to create your own movies. But you’re limited to the size of your MemoryStick. Actually there are no tools that allow you to “syncronize” automatically with your video recorder/media center/whatever-media-recording-device. I don’t want to compare the possible video resolutions because they depend on that Portable Media Center you are buying/using. A big advantage of the PSP is that Sony tends to be more open to codecs and new codec developments. For example: The latest Firmware update for the PSP enables H.264 on the PSP… that’s one thing only future versions of the PMCs would have (as far as I know). Another type of device – the normal Windows Mobile Devices – is not part of this article – but as I wrote some hours and weeks ago there is the same sync functionality built into current devices using the Windows Media Player 10. But if you want to play other formats with other codecs (like MPEG4) you have to use other Software Players like The Core Pocket Media Player. One last thing: I really don’t get the idea behind the Movie UMDs. Who wants to buy a movie for about 15-30 Euro in a format he can only play in his PSP when you can get the DVD for about 8-15 Euros…I don’t think that this will work for Sony…actually it does not work for me.